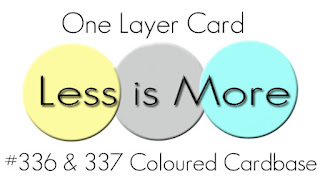 Hello, today I am playing along with the Less is More and AAA cards collaboration challenge. 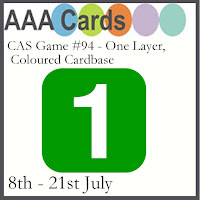 The challenge is to use a coloured card base and keep it CAS. I was very fortunate recently to win a stamp of my choice from The Ton's newest release on their blog hop. My comment was chosen from the lovely Lisa Harrolle's blog, do yourself a favour and click here"Embellish my world" to see her amazing creations! I chose the "Peony Terrace" cling background stamp and I have used it in the corners of my card. I stamped it onto a pink card base with versamark ink then clear heat embossed. I coloured the inside of the image with a white prisma pencil and lightly sponged over the top with Distress Ink in picked raspberry. I stamped my sentiment from the Young at heart stamp set by CAS-ual Fridays exclusively for CP Stamp of Approval. Such a beautiful and subtle colour scheme. It looks amazing! Thanks for playing at AAA Cards. Wow! This is such a stunning card! Love the soft colour scheme and the stamp you chose! Thanks for playing along with us at AAA Cards! So pretty, Michelle. The pink is a great choice for this image. Beautiful pencil work. Thank you for joining us at Less is More in our special collaboration with AAA Cards. A soft and elegant card. So pretty! Thanks for sharing at Less is More! Hi Michelle, what a lovely idea. The colour you chose with the stamp, the white colouration and the distressing gives a fantastic effect! Soft, subtle and elegant. Love it Michelle. Stunning! I love the softness of the flowers and I love pink. Congrats on winning a gorgeous stamp set. Thanks for playing along with us at AAA Cards!! Hello Michelle! Love the soft tone on tone florals on the corners. Thank you for sharing with us at AAA Cards. Beautiful tone on tone. I love the simplicity. Love the soft and pretty pink card! So pretty and soft - this is just stunning! Congrats on winning with this amazing card! A beautiful monotone card! Great design idea to use only a part of the Peony Terrace stamp! Congrats on being showcased at LIM and thanks for your sweet words on my blog, Michelle :)! This is pretty! so soft!